FREEFALLING: Darren Griggs has qualified for the Canopy Piloting World Cup in South Africa. 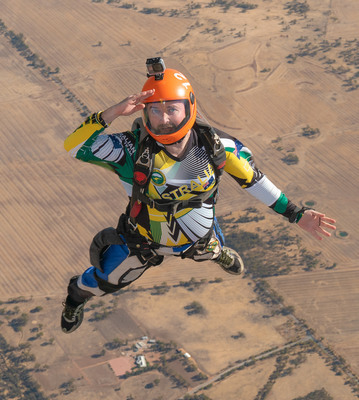 A Barwon Heads skydiver has leapt into contention for a world title in South Africa. Darren Griggs, 40, qualified for the Canopy Piloting World Cup in November after winning bronze at a recent Australian and New Zealand championships in Western Australia. “To be honest, I wasn’t expecting a third,” Mr Griggs said. “It was a very tight competition with a lot of great jumpers and it was our largest national comp with over 50 competitors. Mr Griggs has more than 4000 skydive jumps to his credit since starting with a tandem dive at Pakenham 21 years ago. “Before that I played footy, cricket and tennis and never really stuck with any of them and found you could do this skydiving thing and it turned out I really liked it. “For me I started quite a while ago with the idea of let’s go and try it and see. “The safety equipment these days is extremely high. Canopy piloting, also known as swooping, encompasses several disciplines involving the flight of a skydiving parachute. The goal of the canopy piloting competition is to negotiate courses that challenge different performance characteristics of both flight and skill. “It’s a very exciting discipline because you’re building up very high speeds and your skill is the thing that’s keeping you safe and alive and intact,” Mr Griggs said. Mr Griggs said he was now focussed on training and amassing the money needed to reach South Africa.